The wood collection (FLASw) of the University of Florida Herbarium (FLAS) is located at 379 Dickinson Hall in the Florida Museum of Natural History on the UF campus. Room 379 is in the west wing of the street level of Dickinson Hall on Museum Road, just west of Newell Drive. The on line UF campus map may help you locate Dickinson Hall on the University of Florida campus. 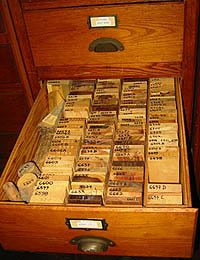 The University of Florida Wood Collection contains approximately 15,700 accessioned wood samples and 1,000 microscope slides (thin sections, typically transverse radial and tangential views). Woods from all parts of the world are included with an emphasis on those of the tropics. The establishment of the wood collection is traced to 1938 as reported in The Annual Report of the Florida Agricultural Experiment Station. "The herbarium has been conferred the honor of becoming one of 15 depositories in the United States for the authentic wood and herbarium material of economic trees of the United States being assembled by the School of Forestry of Syracuse University under the leadership of Dr. H.P. Brown. To date this comprises 260 specimens of leaf and flower material, 63 packets of fruits of plants represented in the above and 215 blocks of wood." The collection was small and dormant for years until reactivated, reorganized and tremendously expanded in 1980 through the efforts of Dr. William Louis Stern. It consists of woods from North, Central, and South America, and many other regions (e.g., Taiwan, Hawai'i, Japan). There is still much work to be done with respect to cataloguing and organization in the collection. A card file arranged by family and species includes most, but not all, of the specimens in the collection. Duplicate specimens (ca. 3,800) from the Smithsonian Institution, e.g., partial or full sets of collections by R.M. King, B.A. Krukoff (Brazilian), G.H. Pickels, W.L. Stern, J.W. Thieret and A.F. Wilson. Commercial Woods Used in the U.S.
Commercial Woods (U.S. National Lumber Association). Commercial Woods of Brazil, Chile, Surinam, and Japan. Milton F. Scott wood collection (ca. 6,700) - a carefully documented, diverse assemblage of specimens. G.C. Bucher, Sr. wood collection (ca. 1,930). New York State College of Foresty at Syracuse University, Project I wood samples.